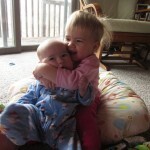 It has been so much fun to watch Zeke grow and develop, and to watch Hannah interact with him. 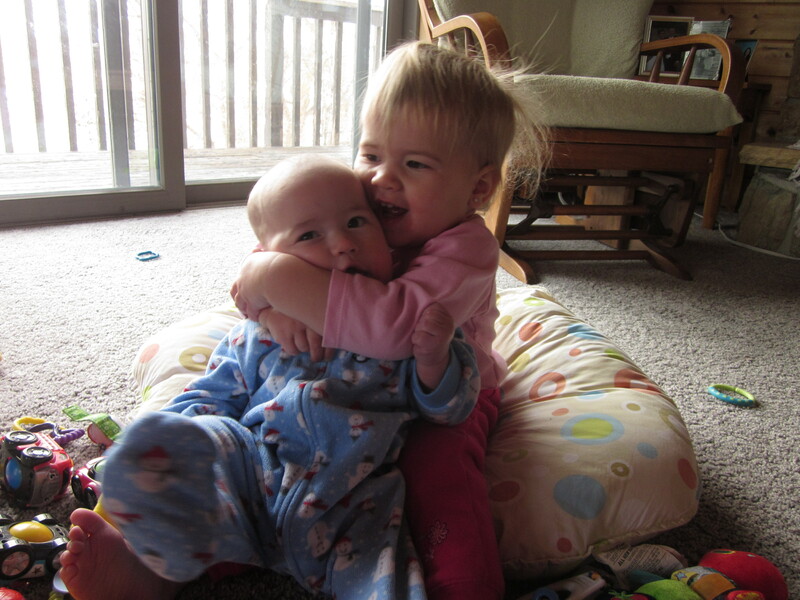 Hannah absolutely adores her little brother, and Zeke is in awe of his big sister. Hannah is 19 months and has an expanding vocabulary. It’s so much fun to review words with her, and give her a task to do, unsure if she will understand it, and she totally blows me away when she completes her task. Today I was tired of all of Zeke’s toys all over the living room floor, I simply asked Hannah to put all the toys in the box. I then continued to do some dishes, forgetting what I asked Hannah to do, and turned around to see our living room floor all cleaned up! Zeke is 5.5 months old and keeps us on his toes. He has been sitting up on his own now, but we still put pillows around him for the occasional fall after sitting up for a while. Zeke has been able to put himself up in a pushup plank position, and can scoot backwards or sideways, trying to crawl after what he wants. We tried to feed Zeke cereal the week before we went to Chicago, and it didn’t go over well. I took the cereal to Chicago with us, but didn’t feed him any because it wasn’t as convenient, plus he doesn’t need it until 6 months. The last few nights though, Zeke has been waking up at 2:30am, and last night was the first time he wouldn’t give up crying. The previous nights he was able to be settled back down without eating. So today I tried cereal with Zeke again, and he ate like a champ! Before Zeke hardly got any cereal down, and today he ate everything I gave him. I’m hoping tonight he’ll sleep better with getting more food in his belly today. I upped how many liquid feedings he had, but that didn’t seem to help, so cereal it is. I’ve also been trying to figure out Zeke’s napping schedule. He pretty much only took one nap today and was super fussy. I had him lay down a few other times when I was sure he needed a nap, but he either fought sleep, or only slept for maybe a half hour if I was lucky. I’m really nervous about tonight and leading into our weekend traveling to Maine to visit a church. My energy is quickly draining with our nights turning rough, and I could use some extra energy for the weekend. Hannah was such a “by the book” baby, and Zeke is throwing me for loops. Either that, or I haven’t read as much this go around since we just did this last year, but I have already forgotten so much about these baby stages. God’s gotta be using this to teach me something. I know patience is something I’ve been learning. I have been there! feeding and nap schedules are so hard because they change so fast as baby grows! and traveling makes it even more difficult. 🙂 you are doing fine… keep up the good work! 🙂 I’m visiting from M2M blogroll. you are featured over there today! 🙂 Nice to meet you! I found your link from M2M because I’m also one of the featured blogs this week 🙂 AND I’m in Minnesota too, so naturally I had to check you out! So, I’ve just gotten caught up a little bit and I would love to get to know you better! Dare 2 Share was at our Church last weekend, so I’m guessing you must live within driving distance of Eden Prairie? Looking forward to hearing from you, also totally relate to your family stage. My husband is the junior high Pastor at Grace and we have a 23 mo old daughter (ava) and a 5 mo old son (carter). In the trenches of napping, feeding, etc 🙂 Nice to meet you! Hope you have a great day! Hi Dana, it’s nice to “meet” you! 🙂 I saw your bio over at M2M and thought I’d stop by. My husband and I were married in July 2006 too. (And he’s in youth ministry!) What a sweet family you have! Adorable! Nothing like these times. Welcome to my blog ladies! @Stephanie: Aww, too bad we couldn’t have met up at the D2S training. I went alone, but hung out with my sister-in-law and their youth group. It was great to see Greg Stier’s ministry first hand. We really like Greg. @Rachel: What a small world. 🙂 Its so much fun to meet yp wives and even more fun to be married around the same time!